Cardiovascular diseases are one of the major causes of death in the world. To understand what is going on inside the heart one should be able to make conclusions that link the mechanical work done by the heart with the metabolism of the heart. This thesis focuses on that link at the single cell level. Two ap- proaches were used to study this relationship: mathematical modeling and ex- periments done on isolated cells of an adult mammalian heart. Mathematical modeling helps to understand the underlying processes involved in the contraction event. Experimental studies on different preparations, from the whole heart to the single cell level, have shown that the energy consumption depends on a certain mechanical index developed during one beat and that relation is independent of contraction mode (isometric, isotonic, physiological). Based on that knowledge, it is possible to estimate the chemical reaction rate constants and other important parameters using the mathematical model of the contracting cell. The contraction process of the cell is found to be cooperative. However, including this cooperativity into the mathematical description has been a problem. This the- sis gives a solution how to include cooperativity to a deterministic cross-bridge model in a thermodynamically consistent way. Using an isolated cell as a sample allows estimating cell properties without the influence of the connective tissue. Also, it gives an opportunity to study cells at a subcellular level. Intact cell experiments are usually performed under unloaded conditions. In this doctoral study, cell contraction experiments were performed under full control of cell lengthening and force generation and, at the same time, biochemical processes were estimated from the fluorescence signal. 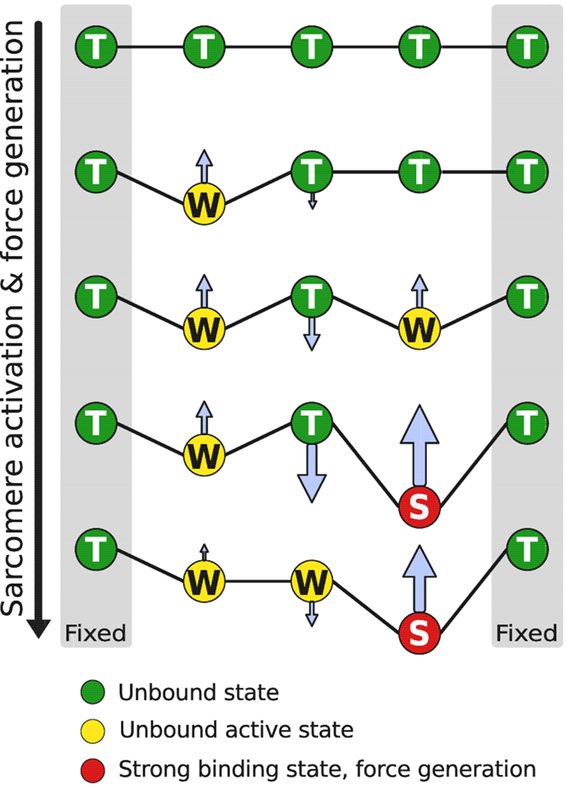 As part of the design of the experimental setup, an algorithm was developed to estimate the mean sarcomere length from microscopy images in real time. In summary, the main contribution of this thesis to the field of cardiovascular research is a thermodynamically consistent mathematical description of cardiomyocyte contraction and an experimental setup for single cell experiments with full control over cell loading conditions and the ability to measure biochemical parameters in parallel.